Okay, it’s Sunday evening, time to go out for a drink and see if we can score a swizzle stick. We bombed out last week (pun intended, the cab ride home was a little fuzzy) so let’s see what happens tonight. This evening’s bar choice is a joint that we’ve actually been invited to. 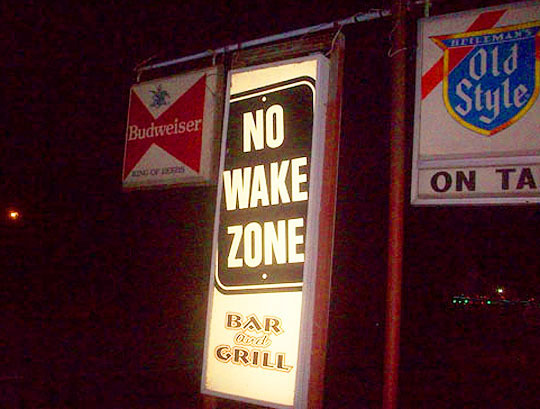 The No Wake Zone is owned by Pete Clarno, who I went to school with (along with his brother, Todd, hi Todd!) He now owns and runs The No Wake Zone and he and bartender Mike Cramer who I went to high school with (along with his brother Scott, hi Scott!) have graciously invited MBIP to go have a drink or ten, tonight. I’ve never been one to turn down an invitation, so it’s off we go in search of a drink and a swizzle stick at the No Wake Zone Bar & Grill. 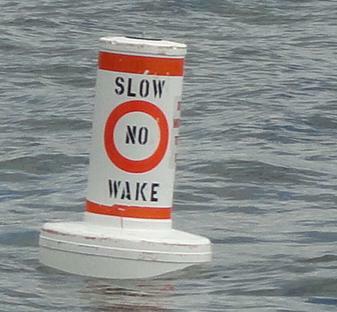 The signpost is ahead, we're about to enter The No Wake Zone! Cue the theme music! Here's the bar, I think the entrance is off to the side. Yep, here it is. Let's walk the plank to the entry way, mateys. I love the knotty pine wood here in the entry room, let's go inside and check this place out! Nice bar and there's plenty of seats to choose from. This is why I like going out on Sunday nights, there's never a crowd. Let's go snag a stool. Steve the friendly bartender is quick with an ice-cold two buck bottle of Budweiser. Steve's the cousin of Mike Cramer, who also bartends here, but isn't here tonight and who's brother Scott was in my high school class. Keep notes on this stuff as there will be a pop quiz at the end of this post! And here's the owners of this fine establishment, Linda and Pete Clarno! They just opened the place in June of last year and it's been doing gangbuster business ever since the doors opened up last summer. The place may be new, but it has the feel of a classic Peoria bar already! They had to get back to business, but Pete said he'd join me for a drink in a little bit, so till then, let's take a look around the joint. A ceiling fan buzzes overhead at the bar. There's a large room behind the bar with tables for dining, drinking and general mayhem. Once in a blue moon lieutenant mayhem happens here and that's when Pete has to put the bouncers on special duty! Do ya feel lucky, punk? If so, come on out and try your hand at these legal state of the art gaming/gambling machines which go live tomorrow (Thursday.) A little touch of Vegas right here down by the river! Floating footballs intermingle with overhead lights that illuminate the bar. Here's the weekly patent-pending taps shot for Spike! The large deck out front. It's a little chilly out here tonight, but I'll check it out this summer for sure! 16 ounce Pabsts for $2.50 on Tuesday's. Such a deal! Some more specials are listed on this board. Two buck domestic bottled beer all January, drinking sure is cheaper back here in Peoria! And you can get a flu shot here! I wonder if they have Vicodin too? Here's some creatures living above the bar. Is that bearded guy Jerry Garcia or the mysterious missing bartender, Mikey Cramer from a few years ago? Only his hairdresser knows for sure and she isn't talking, so I guess we'll never know. Greg's a regular here at the bar and a man with precise photobombing expertise, which you'll see as you scroll down this post. I noticed all the dollar bills hanging on the mirror at the bar, so I asked bartender Steve for a magic marker and took out a single. And here's Steve hanging up the newly minted single on the mirror. Baboom! MBIP is represented at the bar! Pete's work is done for the evening and he joined me on the other side of the bar for a couple of cocktails. Remember what I said about Greg's photobombing skills? Well, there you have it! And now for the swizzle stick moment of the evening. I ordered the double gin and tonic and it came with the standard red plastic stirrer. Better than last week's straw, but still no swizzles to be had in Peoria. Maybe next week. As the night comes to a close, I retreated to the bathroom for an obligatory bathroom mirror shot. Knowing that I was going to be having more than a few drinks, I took a cab to the bar. 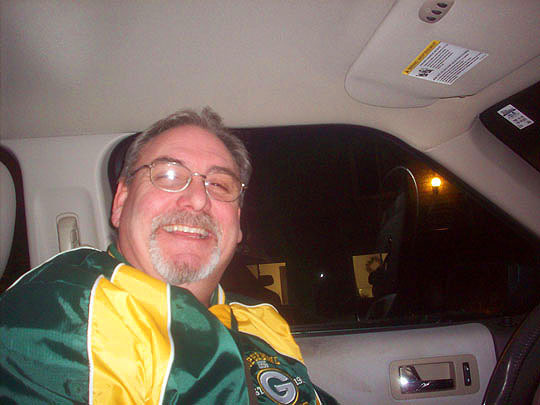 I was going to call for one to take me home, but Pete volunteered to give me a ride to my apartment! This is a bar that really delivers (another pun, fully, wooly and bully intended!) 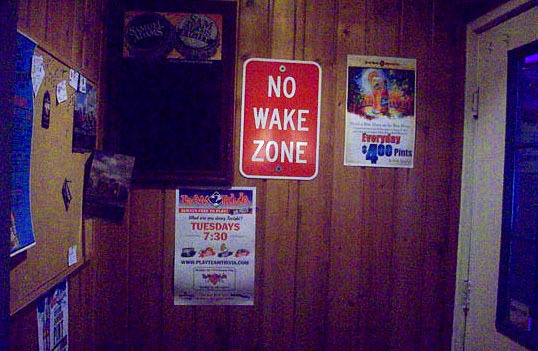 Thanks to Pete, Linda and Steve for the great hospitality and service at the No Wake Zone Bar & Grill! I'll be back soon, so check into getting some swizzle sticks there! See you all tomorrow! Further reading: Peoria Journal Star, foursquare and Meet Up. Wake up, little Susie, wake up! So today wouldn't be entirely swizzle stickless, Jaws sent in this piece of locally-influenced swizzle art! And you can read more about Milton Budd at the piece Jaws wrote a few weeks ago right here. Thanks, Jaws!